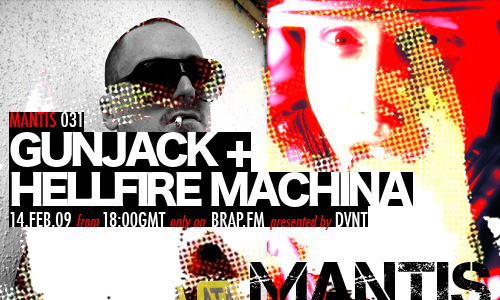 Slamming techno bod Gunjack AND heavy dub duo Hellfire Machina both guest on Mantis Radio this week, with a session a piece. Being as it’s Valentine’s day, we have a bit of V D massacre for you. Not one, but two showcases on offer, courtesy of Gunjack and Hellfire Machina. Heading up our first of this weeks 2 showcases, we present Gunjack. Native to Los Angeles, California, Gunjack AKA Brian Gibbs started his first label, Deafmosaic while residing in Tokyo, Japan. Gibbs later moved to Spain and released many techno gems through Jaxx Records, Madrid. Currently Gibbs is in South America. His beats are utter filth, and his production showcase is going to be a relentless listen make no mistake. Stepping out from the Big Apple, but originating from London, Hellfire Machina have been turning heads since the projects inception last year. Sonic exploration in the realm of 140 bpm, with an ethos of non conformity, heavy bass and fierce attitude, the Hellfire crew are set to explode. Their productions have already been devastating dancefloors around the world which has led to a biweekly DJ residency in New York, numerous releases penned for the first part of 2009 not to mention a host of remixes that are currently being crafted in their studio Planet Twisted. Hellfire consists of Jody Shires aka Mechabot1 (one half of Sunz Of Mecha + Uncouth Youth / label boss of Mechanoise / owner of BreaksFM), Tom Williams aka Chosen Substance (founding member of Junglist Movement and Raw Groove), and Michael Deane aka Mikey FX (one half of Cause n FX / part of the team behind Mechanoise).